We first went to the Rising Sun because of a recommendation from a fellow skier. 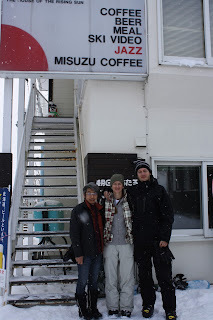 We almost didn't go in because from the outside, it's rather unassuming - almost like a coffee shop. However, venture inside and you'll find a cozy wood panelled restaurant with a warm chalet atmosphere and very friendly staff. Waiter Yoshi, Japanese by birth but substantially ozzy from the 45 years he's lived there, was absolutely delightful and a pleasure to chat to during our drop-ins. For our first visit we went for dinner. 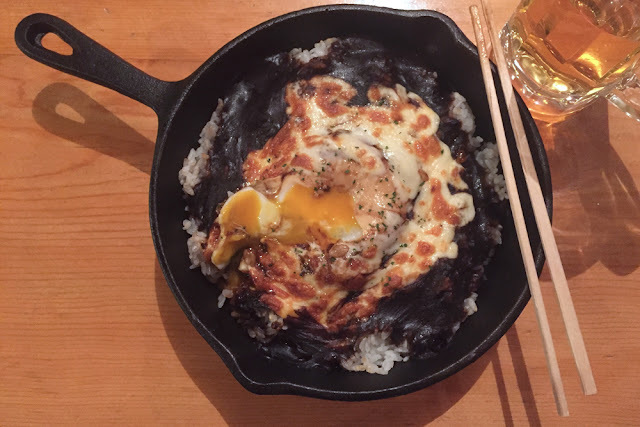 I had the baked curry which was delicious: a meat ball surrounded in rice and curry, topped with a gooey egg and finished with Furano cheese melted on top. It's the perfect warming meal after a long day snowboarding. Ollie had a sausage curry with I (which I believe were home made) which he thoroughly enjoyed! Whilst eating dinner, I thought I recognised the owner. After inquiring, it came to light that he was non other than Gonzo who worked at the North Country Inn when I stayed there with my mom 9 years ago. He was so sweet during our last visit and helped to take my mum buy some ski boots in town. He opened Rising Sun a few years ago and is renovating it this summer to also have accommodation and mentioned the restaurant will move to the front ground floor next year. We're very excited to hear they have more to deliver and look forward to coming back soon! While we were eating our dinner, we found out Rising Sun also serves breakfast. 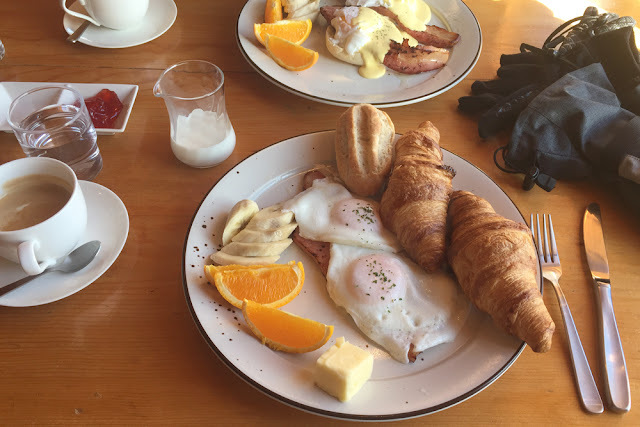 Our pension did not serve breakfast and we had only been able to find rather plain options by the ski slopes. We ended up coming the next morning, and every morning after, for their hearty breakfast of either tasty Eggs, Bacon and Croissants or Eggs Benedict. The breakfasts were served with fresh fruit and a coffee, tea or juice.